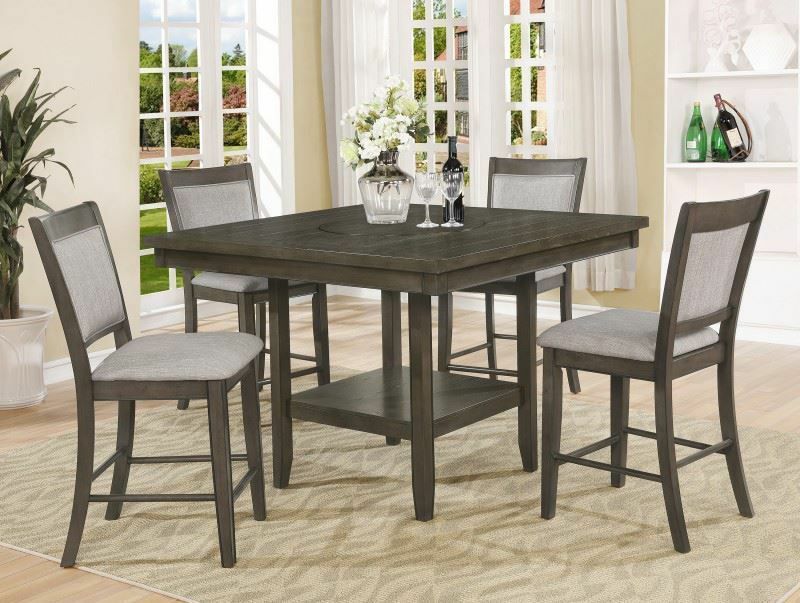 The Fulton Grey Counter Table with Four Stools makes for stylish, convenient dining. The pieces are constructed of Chinese oak veneer in a neutral grey finish, allowing them to effortlessly blend in with any existing dining room themes. Complete with a plank top, the counter table has the eye-catching appeal to elevate the look of your home. An additional perk, the built in lazy susan in the middle of the table is incredibly ideal for storing your wine bottles, additional china, table cloths, and so much more! Thanks to their upholstered seats and backs, these stools promise to cater to comfort, allowing you to always feel cozy and at home as you dine. The Fulton Grey Counter Table with Four Stools makes for stylish, convenient dining. The pieces are constructed of Chinese oak veneer in a neutral grey finish, allowing them to effortlessly blend in with any existing dining room themes. Set includes counter table with four stools.